With over 350 million cartridges ending up in landfills every year, we have to take the necessary steps in recycling these heavily used items. If you’ve always wanted to recycle toner cartridges or ink cartridges that you have piling up, then you have a variety of ways available. The most common place that accepts used ink and toner cartridges is the local office supply store. Every city and town has one. Ask around if they take them and, if so, how many per drop off they take. The ink and toner cartridges that office supply stores accept are usually filled and resold at a much cheaper rate. If you’ve been looking for replacements or if you’re looking to stock up on your ink and toner cartridges, you can make drop-offs and purchases both at the same trip to save yourself some time. Many businesses also offer to buy old cartridges that are in good condition in bulk via mail. Look around for opportunities in your area or places close to you online. The more cartridges that you ship off, the higher the possibility that you earn money from your once used cartridges. Take note that some businesses might require you to refill your cartridge before they purchase it. If you want to make money from the empty ink and toner cartridges that you have stored, you can look into programs such as eCycle Group, Recycle 4 Charity and Cartridges for Kids. They have specific guidelines on how you can earn money from old cartridges. You’ll also be helping a good cause in recycling and saving resources. Ensuring that the cartridges are in good condition is also important since many facilities are not going to accept them if they’re bent or melted in any way. There is no point in using the cartridges again if they’re not going to function like they should. Most cartridges are cross-compatible with printers that were released in the same year. However, it is not suggested to try the compatibility unless you have read reviews guaranteeing that they are. Giving away your old cartridges to your friends and colleagues is a good way to earn points with the community. 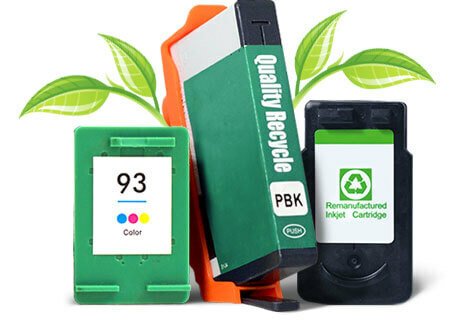 You might even encourage the next person to recycle ink cartridges. Make sure that your cartridges are in good condition though. There shouldn’t be any missing parts since one missing part of the cartridge can be the cause of a whole printer unit breaking down. If you have an idea of what to do with your cartridges, you can try recycling them yourself. Be careful in handling them though as you can easily end up with a stained shirt while trying to come up with a creative way to use cartridges other than their original intended use. Finally, the most simple way that you can recycle your ink and toner cartridges is by refilling them yourself. You can buy refill kits from office supply stores. They come with a syringe, screw tool and a bottle of ink. A refilling kit will have a simple and easy to follow guide on how to easily refill your empty cartridge.